While we where in Priorat last weekend, our friend-in-blog, Ruth Troyano tipped us off to a promising event at the Falset castle, a historic building that has been turned in to a wine museum dashed with an erratic spray of opening hours. The Castell del Vi museum also frequently hosts tastings and talks revolving around, well, wine. While the castle is perhaps not too impressive, it has great views of Falset and the Montsant mountains. Plus, the events are definitely worth checking out. 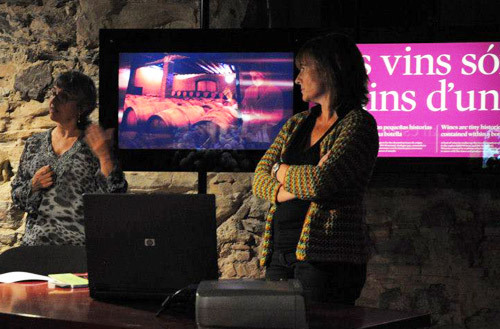 The event last Friday was about the history of making spirits in the area, by the author of a book (in Catalan) on the subject, Anna Figueras. She also turned out to be the owner of what we hear is a fantastic casa rural hotel in Torroja del Priorat, Cal Compte. Figueras explained how the coastal areas of the Tarragona province (where the Priorat county is located) experienced a boom in distilleries at the end of the 1700s and beginning of 1800s, mainly for export to The Netherlands by boat. By 1850 every village in Priorat had at least one distillery if not more and Reus, on the coast, became really well-known internationally for its production of vermouth and other grape-based liquors. While the topic of her talk was very interesting, Figueras was lengthy and not very focused so by the end of it we had almost dozed off. On the plus side, we learned about a spirit fair happening in a couple of weekends in the neighboring county of Terra Alta, the Festa de l’Aiguardent de Prat del Comte. Aiguardent is the Catalan name for grape must-based spirits that translates as “firewater”. The best part of the evening, though, was the tasting that followed the talk. It was, of course, a tasting of an aiguardent–the only one made (legally) in a traditional way in all of Catalunya. It’s called La Quinta Essència dels Llops and is made in Priorat by Philippe Geerarset and the ubiquitous René Barbier with grapes from the wineries owned by the latter. Philippe’s wife Brigitte, who was actually the one presenting the tasting, designed the labels. Roughly translated in to the English, the name means, “the finest essence of the wolves” which would infer a grand, overall fieriness to drink. Sure, it’s definitely strong and something to kick back in shots. But, it’s also wonderfully refined. Delicate floral elements come out in the aromas and the body while it warms the throat and inevitably, the soul. 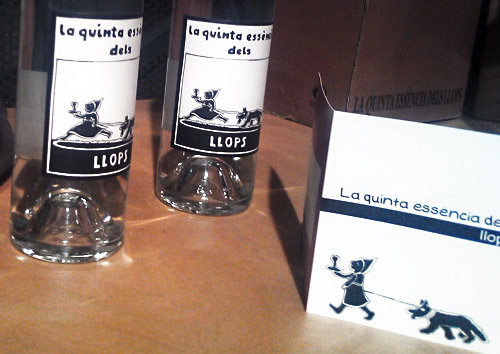 A fine spirit to taste after sampling the other end of the vines in Priorat we know as wine.